Emilio Segre was professor of Physics at the University of California, Berkeley (1946-1972). Other institutional affiliations include University of Rome, University of Palermo, and Los Alamos Laboratory. His research interests include atomic spectroscopy, moleculear beams, slow neutrons, radiochemistry, isomerism, spontaneous fission, and high-energy physics. February 1, 1905Birth, Rome (Italy). 1928Obtained PhD, University of Rome, Rome (Italy). 1930 – 1935Assistant Professor of Physics (1930-1932) and Associate Professor of Physics (1932-1935), University of Rome, Rome (Italy). 1935 – 1938Professor and Laboratory Director, University of Palermo. 1938 – 1989Research Associate, Radiation Laboratory (1938-1946); Professor of Physics (1946-1972); Chair, Department of Physics (1965-1966); and Emeritus Professor of Physics (1972-1989), University of California, Berkeley, Berkeley (Calif.). 1943 – 1946Leader, Radioactivity Group, Manhattan Project, Los Alamos Laboratory. 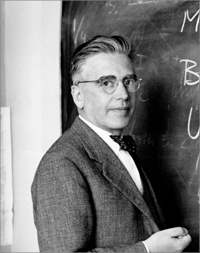 1951 – 1952Visiting Professor, University of Illinois, Urbana-Champaign. 1952Member, National Academy of Sciences. 1959Awarded Nobel Prize in Physics with Owen Chamberlain "for their discovery of the antiproton". April 22, 1989Death, Lafayette (Calif.). Advised by Segre at University of California, Berkeley, Manhattan Project; shared the 1959 Nobel Prize in Physics "for their discovery of the antiproton;" and both employed at University of California, Berkeley. PhD advisor at University of Rome and both employed at Los Alamos Laboratory, Manhattan Project. Advised by Segre at University of California, Berkeley, "Studies in fission in heavy elements under high-energy bombardments" and both employed at University of California, Berkeley. Advised by Segre at University of California, Berkeley, "Effect of chemical structure on stopping powers for high-energy protons". Advised by Segre at University of California, Berkeley. Advised by Segre at University of California, Berkeley, "The Internal and External Continuous X-rays Excited by the Beta-particles of P." and both employed at University of California, Berkeley. Advised by Segre at University of California, Berkeley, "Experiments on polarization in nucleon-nucleon scattering at 310 Mev." Both employed at the Los Alamos Laboratory, Manhattan Project. Both employed at Lawrence Radiation Laboratory. Both employed at Los Alamos Laboratory, Manhattan Project. Both employed at University of California, Berkeley and Lawrence Radiation Laboratory. Both employed at University of California, Berkeley and Los Alamos Laboratory, Manhattan Project. Leader, Radioactivity Group, Manhattan Project. Leader, Radioactivity Group, Los Alamos Laboratory. Obtained PhD (1928). Assistant Professor of Physics and Associate Professor of Physics. Department Chair; Professor of Physics; and Emeritus Professor of Physics. Clarence E. Larson science and technology oral history collection, 1983-1993. Emilio Segre lectures and other collected recordings, 1968-1997. Emilio Segrè papers, circa 1942-1989. Fermi Memorial Session [sound recording] / American Physical Society spring meeting, 1955 April 30. General interest session on history of physics [sound recording], 1972 April 25. Joint symposium of the Division of Electron and Atomic Physics and the American Association of Physics Teachers [sound recording] : History of spectroscopy / 1981 January 28. LBL Physics Division scientific logbooks of Owen Chamberlain, Emilio Segrè and Clyde Wiegand, 1946-1954. LBL Physics Division technical records of Emilio Segrè, 1942-1963. Los Alamos report 24: lecture series on nuclear physics, 1943-1944. Nobel laureates on scientific research project : oral history, 1964. Notes on physics courses given at Los Alamos, 1943-1946. Nuclear history [sound recording] : voices of the past; compiled by Glenn Seaborg. Oral history interview with Emilio Gino Segrè, 1964 May 18. Oral history interview with Emilio Gino Segrè, 1967 February 13. Oral history interview with Georg von Hevesy, 1962 May 25 and 4 February 1963. Reminiscences of Emilio Segrè : oral history, 1964. Segre and Seaborg present plutonium sample to the Smithsonian Institution in recognition of the 25th anniversary of plutonium [sound recording] / 1967 March. U.S. Atomic Energy Commission lecture series on nuclear physics, 1943. Albert Kempton papers and correspondence, circa 1930-2000. Archivio Gentile papers, circa 1925-1943. Atomic year 25 [sound recording] : the story of CP-1 / produced by the Atomic Energy Commission's Argonne National Laboratory. Enrico Fermi letters to Enrico Perisco, 1918-1926. Glenn T. Seaborg papers 1866-1999 (bulk 1940-1998). History of atomic energy collection, 1896-1991. Hugh T. Richards response to 1981 History of Nuclear Physics Survey, 1990. Igor E. Tamm papers, 1921-1971.
International congress for nuclear physics, quantum electrodynamics and cosmic radiation [motion picture] / photographed by Heinrich Medicus. Jesse W. M. DuMond papers, 1912-1976. Keith Brueckner manuscript biography, 1986. LBL Office of the Director records of Edwin M. McMillan, 1907-1991. Letter to Emilio Segrè, 1933. Oral history interview with August Carl Helmholz, 1975, 1989-1990. Oral history interview with Cecil E. "Chuck" Leith, 1997 July 2. Oral history interview with Clyde Edward Wiegand, 1977 September 26. Oral history interview with Edoardo Amaldi, 1969 April 9 and 10. Oral history interview with Franco Rasetti and Enrico Persico, 1963 April 8. Oral history interview with Giuseppe Occhialini, 1971 April 5, 6, May 16, 17, and November 18. Oral history interview with Hans Bethe, 1982, 1993. Oral history interview with Herbert F. York, 1975 September 9 and 1976 May 13. Oral history interview with John J. Livingood, 1977 May 16. Big machine physics at Berkeley, Harvard and Argonne: oral history transcript / John J. Livingood; tape recorded interview conducted by Arthur Norberg on May 16, 1977. History of Science and Technology Program, The Bancroft Library, University of California, Berkeley, California, 1982. Oral history interview with Luis Alvarez, 1967 February 14 and 15. Oral history interview with Maurice Goldhaber, 1967 January 10. Oral history interview with Norris Edwin Bradbury, 1976 February 11. Oral history interview with Owen Chamberlain, 1976. Oral history interview with Philip Morrison, 1967 February 7. Oral history interview with William Hunter McCrea, 1978 September 22. Oral history interview with William W. Havens, 1991 February 21, July 17, 29, Augut 5, 12 and 14. Oral history joint interview with James Franck and Hertha Sponer-Franck, 1962 July 9 to 14. Outtakes and candid footage from the production of : The world of Enrico Fermi, circa 1930-1968. Rochester Conference on High Energy Nuclear Physics proceedings, 1952 and 1955. Selected correspondence and related materials from the Wick archives, 1933-1945. Text materials for documentary film: The world of Enrico Fermi, circa 1930-1968. The Italian navigator has landed...a half century of nuclear energy [videorecording] / Argonne National Laboratory, producer ; U. S. Dept. of Energy ; Japan Atomic Energy Research Institute ; Power Reactor and Nuclear Development Corporation-Japan, sponsors ; Peter Graves, narrator, 1992. U.S. Atomic Energy Commission records (Record Group 326), 1923-1975. A mind always in motion : the autobiography of Emilio Segrè / Emilio Segrè. Autobiografia di un fisico / Emilio Segrè. Experimental nuclear physics / E. Segrè, editor. From falling bodies to radio waves : classical physicists and their discoveries / Emilio Segrè. From x-rays to quarks : modern physicists and their discoveries / Emilio Segrè. Nuclei and particles : an introduction to nuclear and subnuclear physics / Emilio Segrè. Personaggi e scoperte nella fisica contemporanea / di Emilio Segrè. Atoms, bombs, & eskimo kisses : a memoir of father and son / Claudio Segrè. Emilio Segrè Physics Today obituary.